Week One at Toronto Sick Kids. A recap of Oct 24-30th. In memory of our baby Kyle: Oct 24, 2011 - Nov 8, 2011. We had 15 days with him. This is a summary of the first 7 days. As many people reading this know, I was pregnant with a baby boy affected with a severe mutation of Ornithine Transcarbamylase Deficiency, which means that he can't metabolize protein properly. Protein gets changed into ammonia, but it doesn't get past that point in affected children. The ammonia builds up, causing potential brain damage, and eventually causing the organs to shut down. We were going to do medical treatment to be followed by a liver transplant. We weren't convinced we would get to the point of transplant, because the treatment would be difficult to manage. But we were willing to try. We were doing it day by day. We were going to try, and if he made it, we would go buy everything that was needed. I was due Nov 14, or Nov 11 based on ultrasound. I've had two previous full term pregnancies. 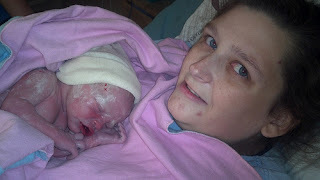 My daughter was born at 10 days overdue. Our first son, who died at 3 days old due to this same genetic disorder, was born exactly on due date. Back then, in 2003, there was no real treatment option available to us, so we did care by parent after he was born. With this history of when I went into labour with previous pregnancies, we booked a planned induction at 38 weeks, 2 weeks before due date, so that the doctors would be ready for us and ready to treat the baby immediately. I was planning on going to live in Toronto starting one week before as a just in case... The doctors wanted me to be in the downtown core of Toronto (over two hours from where we live) as a precautionary measure in case I went into labour early. Things don't always work out as planned. My Facebook Status on Saturday Oct 22: "I will be moving to TO on monday. If you don't have my text # let me know and I'll send it to you. My phone also has facebook, so you can still find me here too." I had been planning on taking the evening Greyhound bus to Toronto on Monday Oct 24th and stay at my cousins for the week, but it didn't work out that way. Instead, that morning I woke up to the very slightest bit of blood upon wiping after using the washroom. I woke up my husband and told him we should probably go into the hospital as a just in case, since I've never had any bleeding in my pregnancies, and I was pretty sure I had "dropped" about a week and a half before. 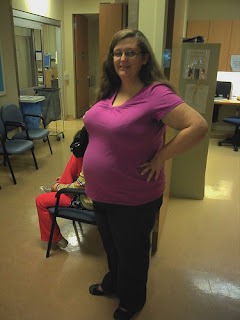 Here is a picture of me at the hospital before they had a room ready for me. 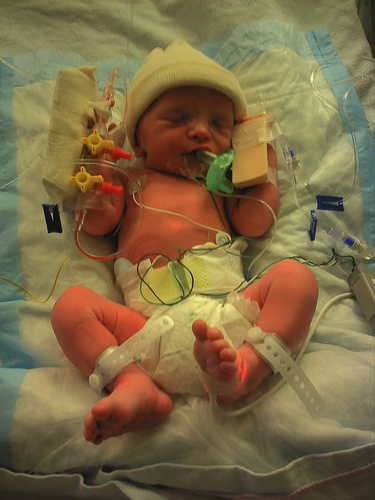 Kyle was born at 1pm, at exactly 37 weeks going by last period date. I was really sick this pregnancy, and had a hard time gaining weight...I gained 4 lbs, and he weighed 5lbs, 5oz. I got the natural labour I wanted instead of the induction, and without the planned PICC line insertion for me that I had been worried about having. Up until a few days ago, I was still bruised from all the bloodwork that had to be taken, which is what they were trying to avoid by having a planned PICC line put in. Considering that I tore out my IV lines, it's probably a good thing I didn't have the PICC line in. My FB status 4:45am Tuesday morning Oct 25: So much for moving to TO a week ahead of time. Was planning on arriving in TO Monday evening, but went into natural labor monday morning! Baby Kyle Alexander Babcock arrived at 1 pm weighing 5 lbs, 5oz, or 2.405kg for the metric people. :) He is across the road at sick kids stable in picu now. Kyle and I right after delivery. Kyle was taken to across the road to Toronto Sick Kids immediately on Monday afternoon. He was started on treatment for the metabolic condition, and was on the liver transplant list by Tuesday evening. He had a PICC line inserted on the Thursday Oct 27th due to all the blood work they were taking from him to monitor ammonia levels, etc. The hospital treated him as a preemie, because of his size, and because the doctors said he was actually more like 36 weeks instead of 37 weeks based on a number of factors including size and digestion. They put him on antibiotics immediately as a preemptive measure since small, preemie babies don't fight infection well. Kyle Day 1 after hooked up to medicine through IV's. On Friday Oct 28th, ammonia levels started to rise gradually. The plan was that if levels went above 200, dialysis lines would be inserted and dialysis started. By Saturday morning they had drifted into the high 200's. High levels of ammonia can lead to brain damage, so the plan was to ensure the levels were kept relatively low. Kyle went into surgery to have the dialysis lines inserted. The surgery went well, but he lost a lot of fluid/blood during the surgery, and looked really tiny after it was done. It then takes a while to get the dialysis set up and primed, and during this time his ammonia levels spiked really high, really quickly...to 600 and then to 900. The spike in levels was unexpected. They were able to bring the levels back down with the dialysis, but in the meantime the room was crazy busy due to the spike in levels and the doctors trying to figure everything out. We had gone in, watched for a few minutes, realized it was too busy, and went and waited in the waiting room. The metabolic specialist said there were 25 staff in the room at one point between pediatrics, metabolics, dialysis, neurology, dietitians, respiratory therapists and more. They had put a breathing tube in before doing the surgery, which was to stay in for at least a few days after. This picture is from the Saturday. PICC line in, dialysis lines in, breathing tube in, NG tube in, and IV's going in in many places. It gives an illustration of how much medicine and equipment he was on at the time. 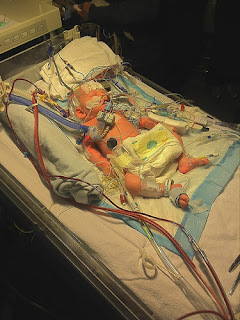 With the breathing tube in, he got bumped up a level on the transplant list from category 3 (in hospital) to category 4 (in hospital in ICU on life support systems). The only category higher is 4F (in hospital in ICU on life support systems with fulminant sudden, full blown liver failure). Over Sunday night and Monday he was considered stable again, although ammonia numbers were starting to rise again. Our daughter went back home after the birth and my mother in law came and looked after her for the week. She came back down on the weekend, but in PICU siblings aren't officially allowed in unless they are over 12 (she's almost 10), because they can carry germs without being sick, and they don't want them transmitted in ICU, so it was hard. Being on the PICU or NICU floor is draining. You can't have food or drinks with you in the room, so I would have to force myself out to go eat/drink. I knew I needed to in order to maintain my own energy, but also because if I got sick, I wouldn't be allowed on the floor or in the room with Kyle. It's a shared room with 3 other children (there are no semi private rooms in ICU at this hospital), and if the doctors were doing rounds, you could stay in the room while they were discussing your child, but had to leave while they were discussing other children. If they were doing a sterile procedure on someone you had to leave. And during shift change between approximately 7 and 8 both am and pm, you couldn't go in either. Add in time away for pumping breastmilk...the lactation consultant recommended pumping for 20 minutes if you were double pumping (both breasts at the same time) or 40 minutes for single pumping, every 3 hours. I pumped, in the hopes that the milk could be used after liver transplant, or to supplement the low protein formula, but nowhere near that amount. It simply wasn't realistic in the situation. You can also only have a total of two people in the room at a time, so if family came to visit, Mike or I would have to bring people in one at a time to see him. When you were in the room, much of the time was spent talking to the doctors and other staff. Pediatrics, Metabolic Genetics, Transplant...each of which had the doctor on call, specialists, fellows, residents, etc, as well as supporting staff such as dietitians, respiratory therapists, transplant co-ordinators, social workers, lactation consultants, chaplains, plus your nurse for the shift. Every staff member we met, from housekeeping to cafeteria workers to doctors and nurses were phenomenal to deal with. During Sunday and Monday Kyle was considered stable, but the ammonia levels did start to creep back up. This is the end of the recap of week one. I think this post is long enough, and I will post week 2 as a separate post, hopefully by later this week. He is so gorgeous! Thank you for sharing. I will keep him in my thoughts and prayers. Congratulations - your son is gorgeous. What a rollercoaster you are all on. your son is beautiful. i am so glad you posted. big hugs. i was so hoping your story would end differently than this. i have been amazed by yoyr strength all throughout this pregnancy. I am so sorry to hear of the loss of your precious Kyle. He is absolutely gorgeous!! Thank you so much for sharing him with us. I will keep your family in my thoughts and prayers. I am so sorry that I didn't know of his passing when I first read your post and commented. I somehow missed your first sentence. The most important one. So so sorry! I will be a better reader in the future. Mary - you didn't misread the first time. I added in the first line later, because when I wrote I was thinking only of people who have known about the whole situation, and not about those who come across the post without knowing. I found it really helpful to write out. The harder post will be the next one for week two, but I think it will be helpful to me to write it out as well.